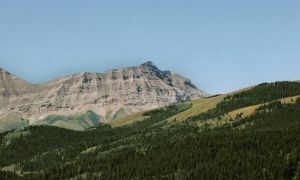 Located NW of Mount Armstrong and NE of Mount Shankland. The North Peak is 1m higher according to the TRIM survey. The mountain could also be considered to have an E peak as well. Name Notes: Named in 1918 after Charles H. MacLaren (C.M.G. D.S.O.) who was a Brigadier General in command of Canadian Artillery Brigade in World War I. He also studied at the Osgoode Hall Law School in 1905.